Maria Tello has always pushed her limits. Whether it’s in her job, her hobbies, or her health, she loves a challenge. When her personal trainer suggested she start competitive bodybuilding, she said it sounded like a “fun idea.” She won first place and two third places at her first competition in April. Tello, a 46-year-old professor at South Texas College for more than 20 years, took home trophies in the novice, open and masters category at Dropzone Physique Showdown in Stafford, Texas on April 21. She will compete again at San Antonio’s Alamo Showdown Classic in November. She said she has always been athletic but began more intense exercise four years ago. Before taking up bodybuilding as a hobby, she consulted her family. She said her husband saw how dedicated she had become to her health and fitness in recent years, and he agreed she should do it when she asked him. She said it seemed like “the next logical step” to him. However, Tello is well aware that the piling responsibilities of being a working mom can get overwhelming. She emphasized the importance of being organized, which she said is the key to fulfilling her roles as a wife, mother and professor. Perhaps the most complex of those responsibilities is her meals, which come seven times a day and are based on what she refers to as a macro diet. Her competition coach gives her specific amounts of protein, carbohydrates and fat to consume every day. She buys the exact amount of groceries needed according to her detailed list for that week, which includes the meals she will make and their nutrition values. To keep it interesting, she gives herself one cheat meal a week, usually on the weekends during family time. Tello said her cheat meals always include dessert, with her favorite being those giant cookies in the skillet with a scoop of ice cream on top. While her groceries are about $60 a week, she said bodybuilding itself can be an expensive sport. Her nutrition supplements range from $15 to $75 a month, in addition to paying her personal trainer and competition coach. Then there’s the custom bikini for her shows, the membership and competition fees, travel expenses, a spray tan, hair, makeup and more – in the end, it’s hundreds of dollars. Despite the high price tag, the money is not her focus. She sees bodybuilding as an investment in her health – she would rather spend this money on protein than diabetes medication. This reasoning is why Tello only does “natural” competitions – those that require a drug and polygraph test, plus a urine test for the winners. Furthermore, the supplements she takes do not give her a competitive edge the way steroids do. Even though she differs on this subject from some others that compete, she said there is still a strong support network among those in the bodybuilding community. Being so dedicated to a sport surrounded by misconceptions means the people in it tend to have an instant understanding of each other. She said backstage at the competitions can be hectic, but everyone finds time to help secure each other’s bikinis, lend each other weights, and cheer as each one walks the stage. Tello noted that along with the tight community, there’s also some strange things bodybuilders do for the sake of competing. Getting a spray tan, for example, is Tello’s least favorite part of the shows. It’s done the night before, with her completely naked, and she can’t shower once it’s on. She can’t use deodorant either as it will turn the skin green. She has to pee in a cup to avoid streaks down her legs. And another thing: the bikinis are so small that they have to be glued on to avoid any movement. 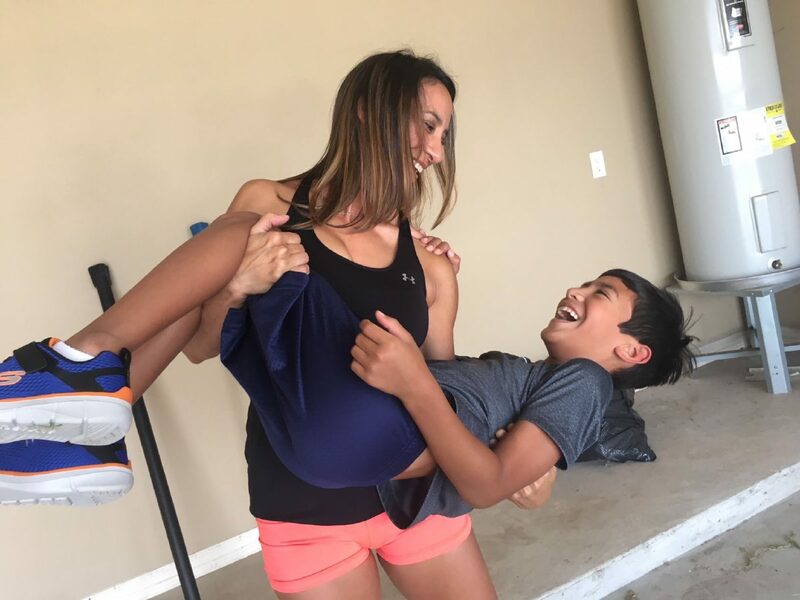 Tello knows this would make most people uncomfortable, so she is grateful that her husband doesn’t seem fazed by any of it despite her gym and competitions being male-dominated. Although he doesn’t typically like much muscle on women, he acknowledged that it’s about his wife, not him. “I still need him to help me open a can of pickles,” Tello said with a laugh. With the strict diet, the strange behind-the-scenes, the expenses and the time-consuming regimen, Tello said it would be impossible if she did not have her family supporting her. Although seeing her body transform every week is exciting, the real thrill is having her family along for the journey.